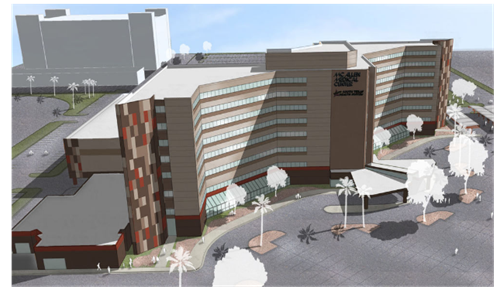 ​​McALLEN – A renovation is in the works for the McAllen Medical Center giving the hospital an exterior facelift. The Medical Center will undergo a $22.7 million renovation that will change the building's façade to earth tone shades. Residents outgrew the 25 ­patient facility built in 1923, and constructed a larger hospital before McAllen sold the license to United Health Services in 1985. Since then, residents often refer to it as "el hospital blanco"—the white hospital—but after the renovations the hospital will no longer be white. Many of the upgrades will in the patient rooms, lobbies and dining room. The patient's room will include a small pull­out sofa, which they hope will give the rooms a more homelike feel. Spawglass will lead the renovation, with crews slated to complete the project in March 2018.